I get that but The Drop explicitly states placing on empty spaces and not on glyphs. A power like this should follow the precedent of The Drop and call out both. The Drop does explicitly state it, but that's due to the figures not being able to be placed next to glyphs. "Empty" has a specific meaning in Heroscape, which is a space not occupied by a figure or glyph or terrain piece. This power works differently than The Drop, for better or worse. Last edited by Scytale; October 29th, 2012 at 12:53 AM. The Drop does explicitly state it, but that's due to the figures not being able to be placed next to glyphs. "Empty" has a specific meaning in Heroscape, which is a space not occupied by a figure or glyph or terrain piece. This power works differently than The Drop, and for better or worse. This is why you are an editor and I'm not. With complaint passed over, I'll vote to review. After reading you post SB I changed the card a little bit for the better by fixing grammar errors and also putting the requirement of being attacked before placing and after initiative is rolled instead of that after so it makes more sense and is more in line with how the drop is set up word wise because with the drop it is before you place OMs you roll and then you place. So it is the same order. So When, with what conditions and then where. So the order for Beam Reinforcements is before rolling initiative, if one of your Isodorans has been attacked, and then where you put them. @ZB Yes they are supposed to be the natives of Isodora. Also, sorry for workshopping a little bit. I didn't change how the power works I just changed the order of it to make it clearer for people. 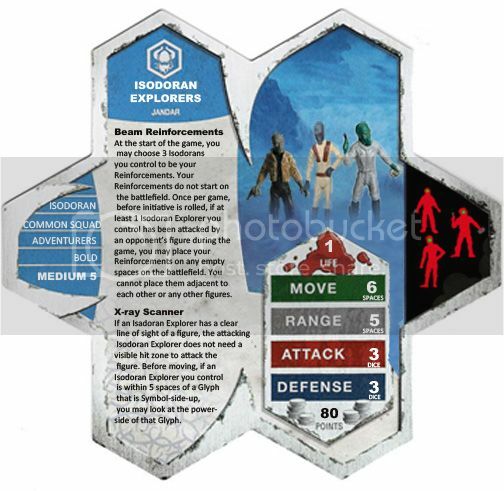 What does it mean for the Isodoran to "not need a visible hit zone to attack the figure"? Don't you mean that the defending figure does not need a visible hit zone to be attacked by the Isodoran? Do you feel that 80 points is low, or high, or spot-on? And why do you feel that way? After looking at a Symbol-side-up Glyph, do you place it back on the space it came from? Symbol-side-up or power-side-up? Yes they can attack figures that normally would be invisible at range such as Goblin Cutters, Nakita Agents, Estivara and a hero with the cloak of invisibility. They have nearly the exact stats as stingers which are very competitive and only 20 points less with one less move. They also have a form of the drop and several other helpful powers that are useful in finding glyphs and not wasting turns if it is a pit trap, dud or anything else that is not helpful. You would return it to the side it was on. The power was based on the C3G's Superman card's X-ray vision. After looking at it the power doesn't seem clear enough, but as of now I don't have enough time to change it right now so I'll fix it later if it is needed. I'm not thrilled about adding another ranged 3 attack common into the game, especially one with 3 defense. The movement of 6 is also quite powerful for a ranged squad and helps make up for their one disadvantage, range of only 5. If the Stingers didn't exist I'd be against them based purely on stats, but with the added point cost they probably won't outdo the Stingers. Seriously potent group though; the Stinger-like offensive power is almost a theme-break for me for a group of explorers, as is 3 defense for guys in jumpsuits. There's also perhaps a bit of a grey area with Beam Reinforcements. If all my fielded Isadorans are dead, can I still place the other three on the battlefield? I think precedent is clear that if all of one's army is dead no power like The Drop can be used, so in that case no. What if you still have other (non-Isadoran) figures on the board? Normally all the powers on a card are gone once all the figures are dead. The answer to this one, in the most technical sense, is that each copy of your Commons have their own army card, thus even if all your other Isadorans are dead those Isadorans are still active and associated with an army card. So it works. The near theme-break I mentioned earlier may be enough for me to vote them down in the end, but I'll willing to take a look at them. I vote to review Isadoran Explorers. Mezzoderms are another 5 range/3 attack/3defense squad. albeit, they have a 1 figure disadvantage. Playability: The powers are clear. I think the figure is fine on its own base, though if you are one of those that rebase everything then a large single base (I mean the D3 big single base not the Deathwalker base) fits it best. It mixes in well with the existing Vydar Soulborgs. You would have to be a super Star Wars nerd to recognize this as figure from that universe. Creativity: The Hoplitron brings plenty of new and creative things to the table. Shield Push 13 is a nifty power to affect board control. It is especially fun with used in conjunction with either Major X17 or Deathwalker 7000. However, the required roll of 13 makes the power too inconsistent for a player to really rely on it. I do wish the d20 roll was 11 instead of 13. I can understand why dok choose 13. Melee Soulborg Bonding is very creative way to modified a bonding power to bring some rarely used heroes back to the table (Major X17 and Deathwalker 7000). Overall, the Hoplitron is a tough melee common hero that functions like a two man squad. It adds new elements to an existing faction and brings some lesser used heroes back to the table. There are a few tweaks that could be implemented that would make the Hoplitron more competitive (Guard class and roll of 11 on Shield Push), but these changes may require higher points. Regardless, all things consider, I vote YES to inducting Hoplitron into the Soldiers of Valhalla. Last edited by Super Bogue; October 30th, 2012 at 01:52 PM. So how goes the unified fanscape review on the Beakface Sneaks and Cxurgy'gath? I would like to nominate my Isodoran Explorers. Minis: from right to left: 30/40 Duros Scout from Imperial Entanglements, 43/60 Duros Scoundrel from Legacy of the Force and 40/60 Duros Explorer from Alliance and Empire. These are all star wars miniatures. After the Soulborg invasion of Isodora the Isodorans were exiled from their home planet and forced to explore the galaxy for a new home world. For years they were drifting in deep space and got lost in an astroid field. Right as their ship was about to crash Jandar summoned them to Valhalla seeing their good virtues and great intellect. Now their home world is Valhalla and they use their technology on the battlefield to quickly send their reinforcements to the aid of Jandar and his forces. The Duros Scout has 183 on abprices and the list includes Auggies. The Duros Scoundrel has 131 on abprices and 152 on Auggies. All and all these guys have a lot of availability and usually are cheap. Balance: I have playtested these guys a number of times and they always seem to me pretty balanced. Creativity: They decent ranged figures that have a good amount of thematic powers full of Sci-Fi goodness. Theme: It's always nice to add new Sci-Fi figures to classic scape and also Isodora seems pretty blank so far as heroscape planets go (all we have from there is the Warden). Though they were never mentioned in the bios or anything else for that matter I feel that they fit into classic scape fairly well. Also they aren't that recognizable as star wars characters (unless I am mistaken) and could serve as pretty much any large headed aliens. Playability: The Duros Explorer has to be rebased since it has the square base that is a bit to thick for ladders, but that is it for rebasing. I'm trying to like this design, but its just not doing anything for me. Its hard for me to pinpoint what it is, exactly, but their powerset seems really bland to me. X-Ray Scanner is marginally useful. Beam Reinforcements looks like it could be useful, but I'm concerned that it could cause problems for many scenarios and I especially feel weird about a Common Squad with a defining ability that only happens once a game. I do like the miniature choices, the left- and right-hand boxes, and the creativity and theme of the powers. to review the Isodoran Explorers. I hate to say no to figures with high availability, but these ones don't seem like a good fit for Scape IMO.